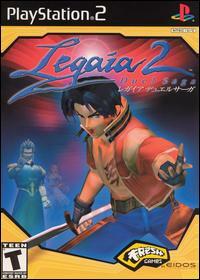 Legaia 2: Duel Saga includes numerous features new to the RPG genre. The game incorporates a unique battle system called 'Tactical Arts'. This system allows players to enter a series of directional button inputs to call up special attack combos and manoeuvres. Tactical Arts attacks will be accompanied by dynamic camera angles to further enhance the effect. Players will also have access to 'Origins' that assist characters in fighting battles and solving puzzles. Each member of the adventure party will have a different Origin available to him or her. These can be used for battling enemies, healing injured party members, and destroying barriers. Players will also have the option of combining different items to create more powerful and useful weapons and tools. Legaia 2: Duel Saga also has numerous mini-games such as darts games, slot machines, roulette, etc, that enrich the gameplay experience. Utilise special attack combos with the Tactical Arts System - a unique battle system never before seen in an RPG game. Call on elemental forces - Origins - to battle enemies, heal injured friends, and destroy barriers. Combine weapons and items to create new and more powerful weapons, tools, and items. Add hours of gameplay with multiple side-missions and mini games including darts, slot machines, and roulette.